Just a quick posts on some sprays I bought today. I love the Hollister Body Spray, it is literally the best smell in the world! But when I ran out I thought I'd try and find another spray that is very similar. 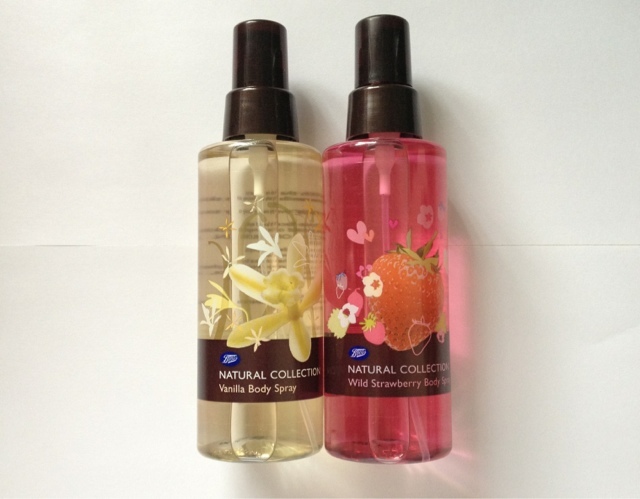 I found the Natural Collection Body Spray in Boots to be the closest, best match and a really cheap price too! One bottle costs only £2 so you could buy 6 for the price of one Hollister bottle. I also think the scent lasts longer than the Hollister spray! The Natural Collection Spray comes in 7 different smells and there all different to suite everyone. I bought the Wild Strawberry and Vanilla, but they also did Mango and Papaya, Samphire and Sea Minerals, Apple and Lime, Ice Musk and lastly, Passionfruit. Do you know any other shops that sell body sprays that no-one knows about? I love having lots of body sprays. I also love smelling good! Love these sprays, I never knew they had so many different kinds, I love the Passionfruit one! Me too! I think I got the mango first so I thought I'd try these, the vanilla is heavenly! Hii I am surendra I was very worry with baldness then I have heard about Hair transplantclinic in delhi and I got a best treatment hair transplant. If you also want to more detail please call +91-9958483335.